Compression testers simply measure the amount of wall flex and correlates that to a number indicating its performance. 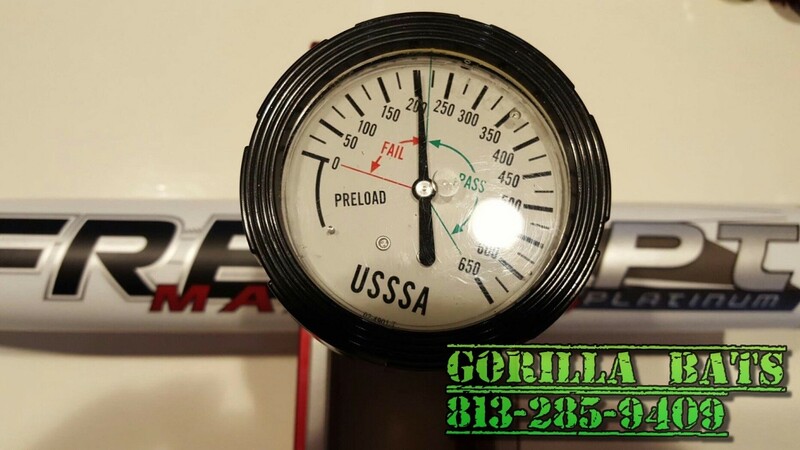 For USSSA and the new stamped ASA bats, the passing mark is at or above 220 or 1450 psi. Any bat that scores UNDER this mark is deemed illegal for use as it exceeds the BPF standards for sanctioned play. In layman terms, lower the score, hotter the product, HOWEVER, this is all relative to a point because not all bats test the same. You remember that Bass Pinky bat a few years back? Well I do because it was the absolute hottest stock bat I have ever owned. Tested at 240 in the wrapper and topped out at 150 when it was said and done. Was hitting 450ft shots with ease and the haters were hating. Now compare that Pinky to my favorite USSSA SHAVED bat of all time, the re-issue Miken Freak Plus. Heavily shaved and tests at 180 when it finally breaks on average yet I was hitting balls 50+ ft in excess with this bat compared to the Pinky. The point here is a compression score is absolutely useless when measuring performance across the board because every bat reacts different as it begins to break in. The only truth to compression is lower the score relative to the bat you are swinging means it is hotter. Depending on the bat and shaving spec, we have seen bats drop as much as 125 compression points still in the wrapper. This is the added distance and exit speed you see when swinging a shaved bat vs stock one. Generally speaking, a broken in shaved bat will test lower than a very well broken in stock bat, but again........there are exceptions. So the moral of the story is lower the compression score does not always translate into a hotter bat. I have been in this business a long time and the stories I hear on a weekly basis just grow and grow and grow. Don't get me wrong, compression matters, just don't get to hung up in the number.